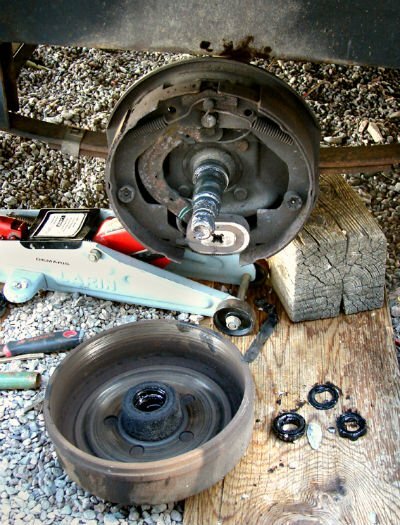 RV maintenance question of the day: How often should you grease your trailer’s axle bearings? Consensus among repair professionals says “once a year.” On the popularity scale, greasing wheel bearings is right around the same level of dumping holding tanks. 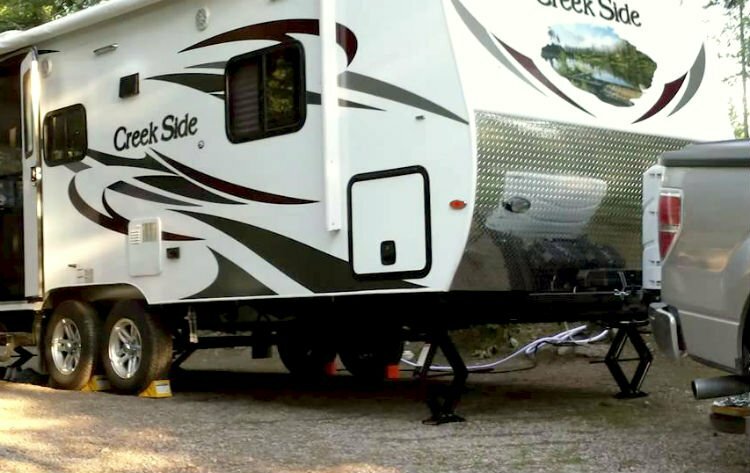 Some RVs are rolling off the assembly line with axles that have zerk fittings. You simply pump grease into the fitting until the old grease replaces the new grease and off you go. It’s quick and easy, but it’s not all that it’s cracked up to be when its comes to this type of maintenance. Here’s why. There’s more going on in that drum than just the axle bearings. 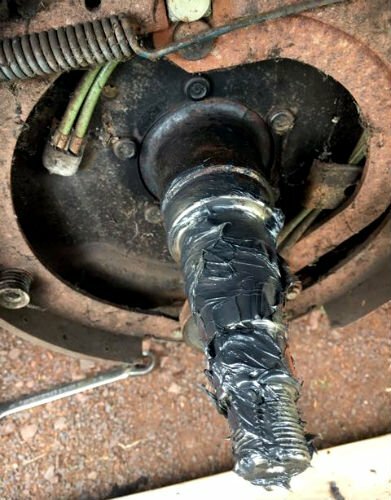 Be sure to take time and go beyond basic axle maintenance. So, when you physically remove the wheel drums and manually pack the bearings, you’ll have a good view of all the vital components. The most obvious inspection points are shoe linings. If they are less than 1/16-inch thick or if the linings are cracked, gouged, grease or oil soaked – or even coming loose from the shoe it`s time to replace the shoes. Also, give the actuating lever a good move. There should be free movement, no rubbing or binding. Check out the magnets as they should show even wear. If equipped with recessed screws or rivets and worn down, it’s time for new magnets. Remember, whatever you replace on one side of the rig you should replace on the other. Also, take a look at the armature (that metal surface that the magnets grab onto) and the inside of the drum. Scoring or excessive wear means turning or perhaps replacement. As some newer brakes are self-adjusting, most must be manually adjusted. This brings us to the bearings. Even if you’ve been ardent about squirting your bearings every year, if you bought the rig used, are you sure the bearings were cared for? Is it possible the bearings have been tortured by excessive heat and are barely hanging on? Picture the disaster that could come from a wheel coming loose and bouncing off down the road. Obviously, if you just “squirt to lube” your bearings, you’ll never have an opportunity to look these critical systems over. Annual hand-packing of wheel bearings could make a huge difference to your safety and peace of mind. Some take the stance that every-other-year internal inspections are sufficient and figure a squirt-lube on alternate years should be fine. However, keep this in mind: Make sure the grease you use is compatible with what’s already inside the hub. Grease is nothing more than oil mixed with soap. The soap makes the oil sticky enough to cling to the bearing surfaces. But with soap and here’s the rub: not all soaps used in making grease are compatible. Bring together those that don’t like to mix and the result is the grease looses its sticky power and it leaves the bearings high and dry – and that fly-a-way wheel becomes a reality. That’s why, if you decide to go with just the quick lube, you should thoroughly tear down and remove all existing grease. Manually repack your bearings and keep careful note of what grease you used for the “initial” packing. Then, when you squirt your bearings, use the same grease. You can’t go wrong. Be aware that the factory bearing grease pack is minimal at best and typically the zerk fitting equipped axles will let grease past the inner seal so as to soak your brakes. you are best off to repack by hand, every year. I lost a wheel with brake drum after only 5,000 miles of use..